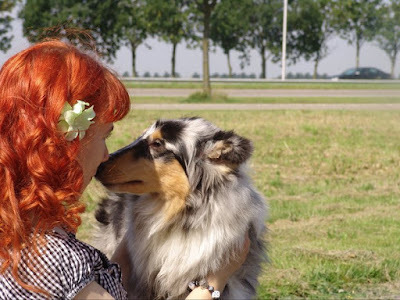 I found that collies over here where not really looking close to what I found was the breedstandard, and me being me, I didn't want to have something that was easy to find, and accesable. After a long period of emailing, waiting, more emailing and even more waiting we could pick up our precious girl Scarlett from Schiphol Airport Amsterdam. I know I was so terrible nervous and exiting at the same time. We where a bit early over there, so we had to go shopping in the mainhall because of some inspections that had been done (probably to check healthpapers). When we arived back at the animalhotel we had to fill in all kinds of forms, I don't even know where that was for, my dad, who was with me, probably knows what it was all about. And after all this formal things we could pickup our crate with pretty little Scarlett in it. We drove out of the busy airport enviroment and released her for the first time from her crate at a gasstation nearby. She jumped out of the crate, into my arms, wagging her tail, and kissing my face, at that moment she made me her best friend. You cannot image how special we both are to eachother. She makes me happy every day, and her first daughter Judy, she delivered on my lap, never wanting to part a cm from where I was going. She is the mom of our first litter, and the grandmom of our second. She is the start of Glamourace Collies, altough we started out with showing other collies, Scarlett will be my special girl.